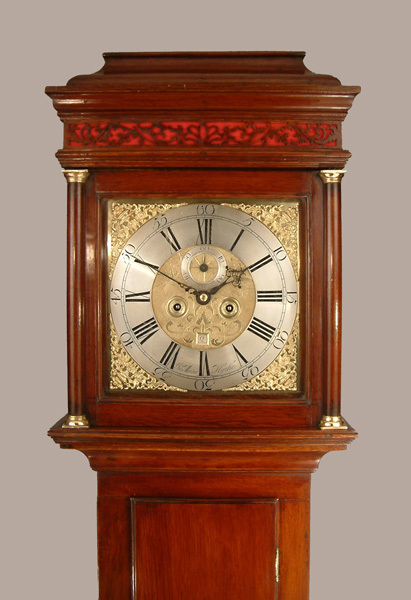 John Mercer of Kent Longcase Oak Circa 1750 - Height 81in. This Longcase Oak Archive's Maker - Jno. ( John ) Mercer of Hythe ( Kent ) is recorded "pre1736". Also recorded as Mayor in 1756, 1768, 1772, 1777 and 1779. "All movements seen are of good quality with 5 pillar movements in oak or walnut cases". Small, well proportioned, long door, oak case with caddy top, "silk" backed pierced fret, brass ( Doric ) capitals/feet, all set on shallow bracket feet. 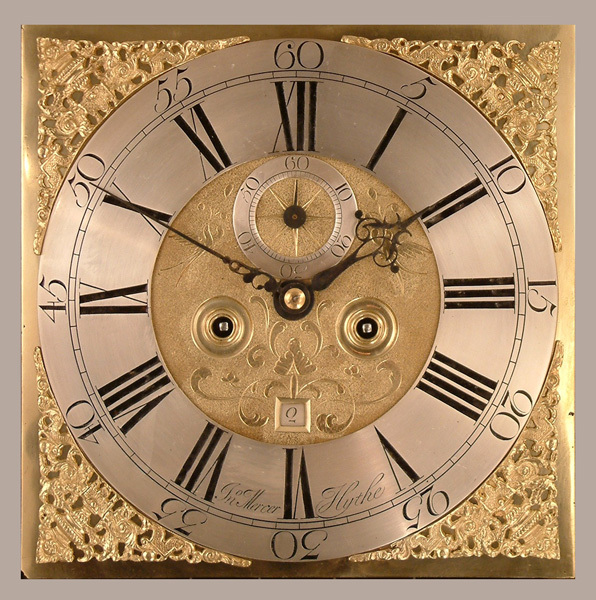 12" square brass dial with finely matted and engraved centre, ringed winding holes, urn spandrels and "starburst" engraved seconds aperture.Blued cut steel hands. High quality five ( knopped ) pillar movement with hourly ( rack ) striking and pull hour repeat. Jno. ( John ) Mercer of Hythe ( Kent ) is recorded "pre1736". Also recorded as Mayor in 1756, 1768, 1772, 1777 and 1779. 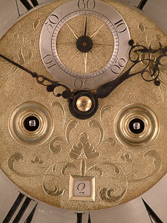 "All movements seen are of good quality with 5 pillar movements in oak or walnut cases". Dating by style circa 1750. Just under 81" ( 205.5 cms. ).